We will spend the next two weeks on the same set of spelling words. The test will be on the last day before Winter Break-- Friday, December 21st. Students now glue their sorts in their Word Study notebooks on Fridays, so please ensure the words come back to school. The Word Wall Test is on Thursday, as usual. We will not have any new Word Wall words next week. Please continue to review all words at home. Please send a quick, healthy snack that allows for easy clean up to school with your child. We take no longer than five minutes for snack time. I notice that some students are throwing away uneaten snacks. Please talk with your child about not wasting food. Thank you! In Reading and Writing, we have been discussing similes--comparing two unlike items using the words "like" or "as." Ask your child why writers use similes in their writing. We will continue writing cinquain poems about Thanksgiving and Diwali this week in writing. We brainstormed nouns, verbs, and adjectives associated with these holidays, and then students were introduced to the format of a cinquain poem. Our Cargo Challenge begins next Monday. Please send boats in with your child as you finish them. If you are going out town next week, your child can test the capacity of his/her boat after Thanksgiving break! Hello, Parents! I look forward to meeting with you and discussing your child's progress at conferences this week. The word wall test will be on Friday since students have off on Tuesday. Also, Spelling is different this week. I chose six words having to do with the election. As a whole group, we read Vote by Eileen Christelow, and then we discussed the meaning of each of the following words: ballot, citizen, election, freedom, president, vote. We also had a mock election in class. 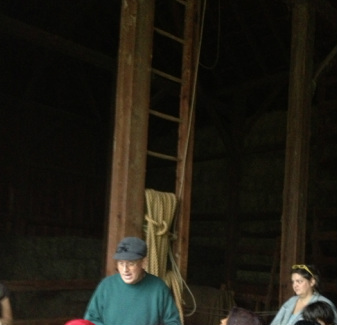 We had fun time at Kline Creek farm, despite the rain! Thank you to the moms that were able to come with us! Thank you for your feedback regarding our Curriculum Night presentation! CogAT testing is now over. I was very impressed by students&apos; patience and effort during our three days of testing! Please remind your child to empty his/her pencil case with spelling words after the test on Fridays. Keep the words at home for future practice. As always, feel free to contact me if you have any questions! Have a great rest of the week and a nice long weekend! Curriculum Night is this Wednesday, September 19th. Two sessions will be held: 6:30-7:10 and 7:20-8:00. I look forward to seeing and speaking with all of you! Please make sure to sign the assignment sheet after your child has completed his/her homework. Thank you for your support!